It’s better to raise healthy kids than fix broken adults. Children have specific needs that require a health professional well-versed in how to treat their particular needs. If not addressed early, they can carry problems into adulthood, when they’re harder to correct. Dr. Josh is a member of the International Chiropractic Pediatric Association (ICPA) and is educated on helping his youngest patients reach the highest levels of health with gentle, precise chiropractic care, free from medications. Dr. Josh keeps your little ones’ nervous systems functioning at their best, so they can develop into the person they’re meant to be! 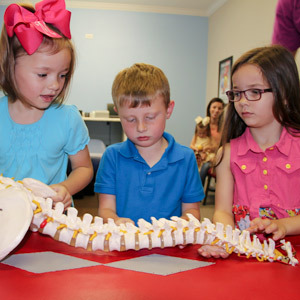 When children enter Core Chiropractic Clinic, they’ll see that the practice is meant for them. Plenty of toys are around; a kiddie table is there for them to use and there are often several other young patients running around our energetic office. The paperwork for pediatric visits is more detailed than for adults. Dr. Josh seeks to understand how their health has been starting with birth, thoroughly going over their history to understand your child’s unique needs. Sometimes, children need to form a relationship with their doctor. Dr. Josh knows that he has to gain their trust. You can bring your child to the office as many times as it takes without starting care, just getting them used to the practice environment. Dr. Josh will play with them, let them lie on our stuffed alligator (which kids love!) and doesn’t begin care until the child feels the time is right. A thorough examination is done at the same time as the adjustment, which is extremely gentle. Dr. Josh is certified in Activator Methods®, an instrument-based technique that is well-suited to children. He also can adjust children simply by using the tips of his fingers. Dr. Josh will provide you with a written report at your child’s second visit so that you understand his plan to help them get better. You might be surprised what chiropractic can help your kids with! Contact the practice today to find out more. Free parking is available, and insurance is accepted.